Kodi is an open source media player software application that is available for multiple operating systems and hardware platforms. This application supports audio, video, slideshows, weather forecasting reports and third party plugins etc. There are lots of extensions that make the streaming of live TV shows and 3D movies in Kodi media player. The Kodi add-ons or extension make it easy for the user to browse the 3D movies for Kodi through the internet and install add-ons with their repository. The different add-ons have different functionalities and features. This media player software is becoming popular day by day because the developers continuously work on it and releasing various extensions to increase the power of this media streaming application. 1 How to Watch 3D Kodi Movies in 2019? 1.1 Can you watch 3D Videos on Kodi? How to Watch 3D Kodi Movies in 2019? The users need to install Kodi using a super repository or a single zip file to watch 3D movies and videos on Kodi. There is a collection of extensions for Kodi that allow the users to watch 3D movies in high quality without any hassle. The add-ons have a great selection of Kodi Genesis 3D movies so that the users can watch 3D movies without buying blue rays. 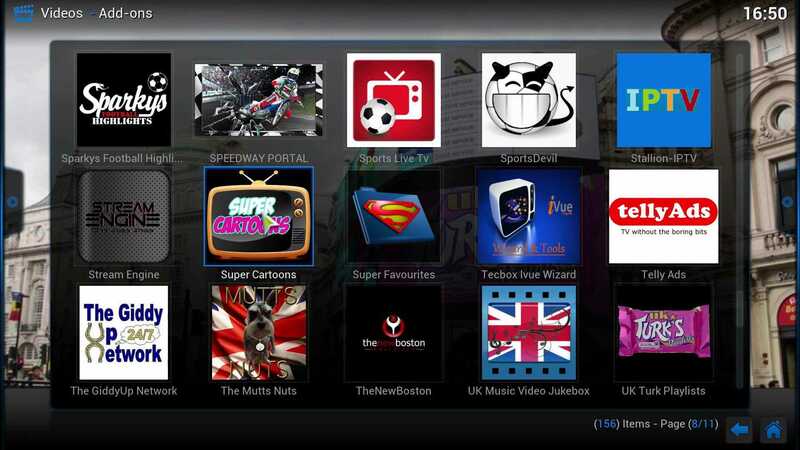 Once the users have installed the Kodi add-ons, they access them from the video add-ons and go into the different sections to play their favorite contents. There are lots of 3D movies available in 720p and 1080p quality. When the user launches a 3D movie they will see Kodi 3D movies side by side split screen view. Can you watch 3D Videos on Kodi? Yes, the user can watch Kodi XBMC 3D movies using various available extensions that are compatible with different devices. These are used to add some extra features in user’s device and offer a broad range of contents from live TV to 3D movies. For watching HD movies on Kodi, the user needs to have fast internet connection and good hardware connection. This media player software has various new and old extensions that allow the users to watch 3D movies on Kodi. Some AddOns can stream 4K full HD movies like 4Horsemen, Falcon movies, project M and release hub etc. This is on the top in the list of Kodi 3D movies addon 2019 that allow the users to watch movies in 4k resolutions. There is separate sections for TV, sports and new movies in the latest version of Phoenix i.e. v3.2.0. This extension and its repository zip file are available through fusion. Also Read:- How to Download and Install DNA TV Kodi AddOn? You have to start the Kodi media player. In the home screen click on the “system” and then “file manager”. After clicking on it, a box will appear in front of you, here click on “None”. Now you have to type the address http://fusion.tvaddons.ag and then done. Next, the user has to write fusion in the box asking for entering a name for a media source and click Ok.
After entering the name, return back to the home page and click on “System”” and them “settings” option. Here, select “Add-ons” and click on install from zip file. A list will appear on the screen where you have to select “Fusion” from the list. After this choose “Kodi-reports” and select language English. Next step is to click on the “xbmchub-x.x.x.zip and wait for notification that says the add-ons is enabled. Now click on the methods to install from the repository and choose add-ons repository asag. In the next step, you have to select Phoenix from video add-ons and click on install button. Wait for few seconds till the notification is displayed that tells the Add-on is enabled. After following all these instructions carefully the Phoenix add-on is successfully installed on Kodi and ready to use. This is one of the most popular and properly working extensions on Kodi. The exodus add-on has a simple and user-friendly interface similar to the Netflix. This Kodi play 3D movies add-ons include features like Trakt integration and Real debrid etc. Start Kodi media player application and then select “File manager” sub-option under “System” menu. Select “Add source” and then enter URL http://fusion.tvaddons.ag and select done. After this enter “Fusion” in the box that says “enter a name for media source”. Return back to the home screen and click on “System” and then “Add-ons”. Now click on install from zip file and then select fusion and Kodi-reports. Click on English and after this click on “onexodus.1.0.1.zip”. Here, select install from the repository and then choose Exodus repository. Select video add-ons and then click on “Exodus”. After this, you have to wait for the notification that says the “add-on” is enabled. As all the steps are successfully done, one can enjoy Kodi 3D movies exodus. The user needs to follow all these steps very carefully for the successful installation otherwise a message will be displayed while you try to play movies or videos i.e. Kodi 3D movies not working. 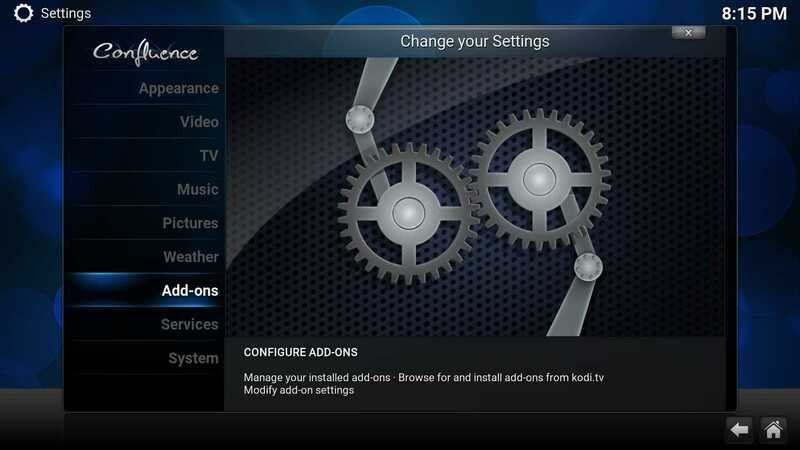 Also Read:- How to Download and Install Kodi on PS4? The first step is to start Kodi home screen and select “File Manager” sub-option under the “System” menu. Click on “Add Source” and select none here. Now type the address “HTTP:fusion.tvaddons.ag” as it is and press done button. After this highlight the box saying “Enter the name for this media source” and type “steamarmy” and click OK.
Return back to the home screen and click on the “setting” sub-option under “system” menu. Click on “Add-ons” and select install from zip file. Now click on fusion and then select Kodi-repo. Choose language English and select repository.xbmchub-x.x.x.zip and wait for the message. After this select install from the repository and Get add-ons on Helix. And click on “TVAdd-on.ag add-on repository. Click on Video add-ons and select “Phoenix” and click on install and wait until the message is received. Access the add-on from the videos add-ons and click phoenix from home screen. And select the alpha reborn. This add-on also comes in the list of best add-ons that has tons of media contents for the entertainment of users. The contents in this extension include comedy shows, movies, sports, Music, T channels, and documentary etc. This add-on features great quality media contents to enjoy 3D movies on genesis Kodi and also provides a different source to stream content. Start Kodi home screen and go to the system and select sub-option “File manager”. Now you have to click on “Add source” and then choose NONE. Next step is to copy URL http://streamarmy.uk/repo/ as it is. Enter name “Stream army” in the box titled as “Enter name for the media source file”. Go back to the home screen and click on “System” and then Add-ons. Now go to the option “Install from zip file”. After this choose stream army and click on the repository.streamarmy.zip file. Wait for some seconds for the add-ons enabled notification. 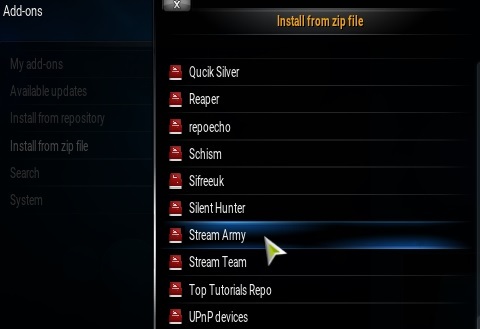 After the message is displayed, select install from the repository and choose stream army. Now you have to click on the video add-ons and then stream army. After this wait for some seconds for the add-on enabled message. If the user follows the above-mentioned instructions carefully, the stream army add-on will be installed on the Kodi. With the help of Kodi 3D movies glasses, one can get the best experience of watching their TV shows and movies. This add-on allows the user to watch 4k, 3D and full HD movies. Silent Hunter has great and fast streaming quality for 3D movies on media player in 3D and 4K resolution and also provides different Kodi 3D movies settings. You can find a great collection of new releases in both 720p and 1080p high quality. Also Read:- How to Clear Cache on Kodi for Different Devices? You have to open Kodi and go to “System”. Here click on “File Manager” sub-option. Click on Add source and then select none. Now the users have to type the URL http://repo.silenthunterstreams.net and then click done. Enter the name “silent” in the box asking to enter the media source name and then press ok. The user has to return back to the home screen and then click on the “system” and then Add-ons. Next step is to install from zip file and then click on silent and select repository.silenthunter.1.0.zip file. Now, wait for some time for the add-on enabled message. Go to the setting and click on Add-ons. Here, click on the option install from the repository and select silent hunter repo here. Now you have to click on the video add-ons and then have to select the silent hunter add-on. After this step, you have to wait for the message and as the message appeared on the screen the add-on is successfully installed and ready to use. This is one of the oldest and popular add-ons to watch 3D and 4K movies, Boxsets movies, new movies, Sports, Live TV, cartoon, radio, and Turkish TV shows etc. This Kodi naming 3D movies add-on features include updated and improved icons and graphics, multi-link channels, allow users to add shows to the library etc. Start Kodi app and from the main menu go to the “system” and then “File manager”. You have to click on “Add Source” and then select none. Now the users have to type the URL http://sparkysrepo.com/turkrepo/ and click on done. In the next step, you have to enter the name “Turk” in the box having title “Enter a name for this media source” and click on Ok.
Navigate back to the home screen of Kodi and select “System” and then click on “Add-ons”. Next step is to click on “Install from zip file” and then “Turk” and repository.ukturk-x-x-x.zip. Wait for some time for the notification and then go to the option install from the repository and then UKTurk Addon repository. After this click on video add-ons and then UK Turks playlists and press install button here. Here, you have to wait for the add-on enabled message. As the message is received means you have done successfully with the installation process and addon is ready to play. This is a one-click play 3D movies genesis Kodi add-on with full HD movies and 3D options. The users can watch all of the new releases, TV shows, old-school movies, comedy and Disney collections etc. Real movie add-on has a collection of 200 HD movies and a great selection of 3D movies. Start Kodi and select “System” menu from the home screen. Click on the File manager sub-option. Next step is to select the “Add source” and then click on None. Now the user has to type the address http://streamAddons.eu/repo and click on done. 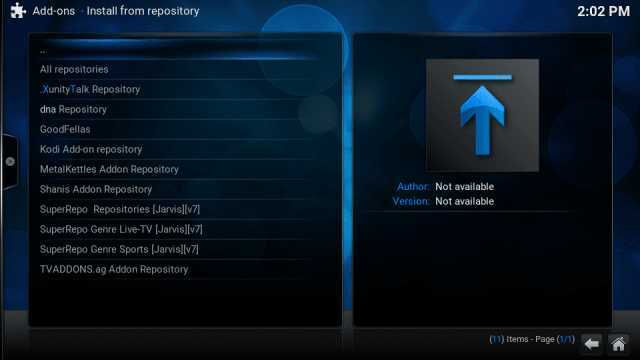 Highlight the box asking to enter the name of media source and enter “Real” or anything that you want to enter and press ok.
After this come back to the Kodi home screen and click on “System” and then “Add-ons”. Here, click on the “Install from zip file” and click on the media source that you have named “Real”. Select Kodi 3D movies repoe. repository.streamaddons.x.x.zip and wait until the add-on enabled message is received. Now once again select add-ons or install from repository and then click on the stream add-ons repo. Now, you have to click on the add-on repository and select stream army repo from here. Click on video add-ons and select real movies and tap install here. At the end, you have to wait for the add-on enabled notification for some seconds. Start Kodi and select option System from the home screen. In the next step, follow the sequence File manager> Add source and select none. Enter the address http://mwiz.co.uk/repo and click on done. Enter the source name according to you in the box saying “Enter name in media source”. For instance, enter “Merlin” and click Ok.
Return back to the main menu in Kodi interface and select system. Now click on the Add-ons and choose install from zip file and then Merlin. After this choose repositorymerlin.x.x.x.zip and wait for the add-on enabled message. Now go to the setting and select “Addon” and then get add-on. Here, you have to select Merlin repo and click on Video addons. In the next step select Project M Kodi add-on and click on install. Wait for some time until add-on enabled message is received. After following all these instructions the Project M Kodi addon for 3D movies will be installed successfully and users can play and enjoy their favorite movies in high quality. If someone loves to watch movies, sports, videos, then they really like Kodi media player. This media player has various add-ons that allow the users to watch high-quality 3D movies in Kodi and provide lots of features that enhance the way of entertainment. All the extensions of the Kodi are easy to install and provides a user-friendly interface that stream 3D movies Kodi in high resolution. Above mentioned are some of the best Kodi add-ons that are great to watch 4k, 3D and HD movies without any interruption. Yes, the user can watch Kodi XBMC 3D movies using various available extensions that are compatible with different devices. These are used to add some extra features in user’s device and offer a broad range of contents from live TV to 3D movies.